There are many things you can do at home to fix stains quickly, cheaply and painlessly with common things you would have around the house. Firstly, it helps if you understand hair construction. Cuticle, a thin layer of overlapping cells covering the entire hair shaft similar to shingles of a roof. The cuticle protects the inner layers when it is in good condition, but sometimes the little “shingles” break away and expose the cortex to internal damage. When this happens all sorts of things can get into the hair itself, oil, dirt or odours are common. Probably the number one thing we are asked about is black oils spots. The one main thing to remember is that oil and water do not mix so do not try to wash the stain out. The oil quickly soaks into the cuticle and it needs to be drawn out. Get some plain baby powder and sprinkle it liberally into the coat and it will start to absorb the oil out of the cuticle. After a few minutes, brush very well and reapply the powder until the spot has disappeared. This is more common than you might imagine and reasonably easy to remove. The simplest option of course is to cut it out, but it is not necessary as a little olive oil will sort the problem very well. Any good quality clear oil will work, simply rub it into the gum and start picking away with your fingernail towards the tip of the hair and it will slide off the cuticle a little at a time. Keep applying oil until it is gone and then soak up the oil with paper towels, and shampoo when it’s convenient. If the paint is water based you should wash it out as soon as possible or at least keep it wet until it can be washed out. If it is enamel paint it is not so easy. Do not under any circumstances pour thinning products on your dog. Remove as much as possible with paper towels and try alcohol wipes on the area while it is still damp and then shampoo well. If the paint has dried you could try the olive oil again or it may need to be clipped out to avoid your dog chewing at it. 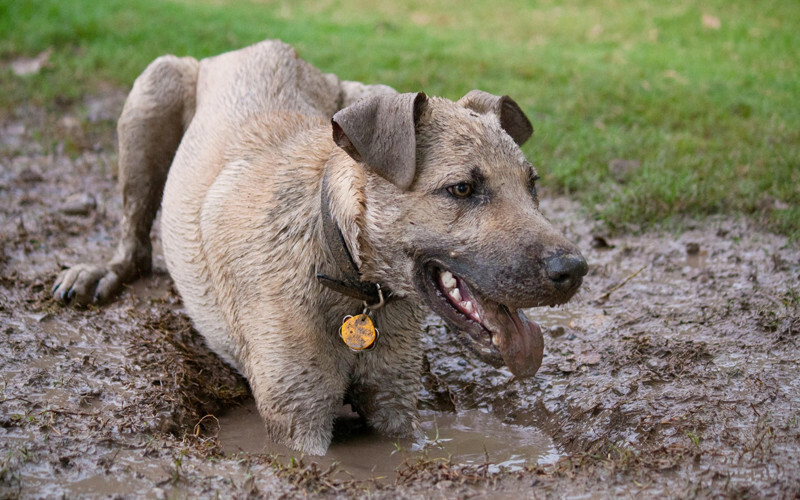 If washing is not an option, some mud is as easy to be rid of as waiting for it do dry and brushing it away. For smelly swamp mud, try adding baking soda in small amounts to the dried mud before brushing and repeat where necessary. If you are not sure what to do, try ringing your groomer first and they should be able to give some additional advice.